One of the largest challenges facing the church as a whole, and each one of us as a part of the body of Christ, is the balance between grace and truth. Some of us err too far on the side of grace, forgetting that without the truth of the Gospel, our efforts at showing grace can actually be harmful. Others of us forget that shoving truth at people without showing compassion is the reason that Christians are often stereotyped as hateful and judgmental. Let us look to our ultimate example: our Lord. He had quite a bit to say to the religious rulers of the day who thought that they were acceptable to God because of following many rules and regulations (many of which had been added to the original Law given by God). He spent a scandalous amount of time encouraging and just being a friend to those that were on the outside fringes of society. Yet He did not leave them where they were; He rescued them from their sins. "Go, and sin no more" are His words. He was the perfect example of a life of grace and truth. All through my teen years as a homeschooled student, one of my favorite things to study was worldview. I love the worlds of apologetics and theology and literature and history, and how they all combine and affect each other. I've read piles of books by C.S. Lewis, Randy Alcorn, A.W. Pink, C.H. Spurgeon, Jonathan Edwards, John Calvin, Martin Luther, Charles Colson, and many more. In all of my reading though, there was a nagging thought at the back of mind. I couldn't quite figure out what that nagging thought was until I read a book called Total Truth by Nancy Pearcey. When I did, the fragmented pieces came together, and I realized what was missing- a total worldview, and a fully consistent lifestyle based on that worldview. Now, there is no shortage of worldview books and curriculums on the market. Many of them are quite good. But what I have noticed is lacking in most of them is an emphasis on 'total truth'. In other words, the student of these books learns some intellectual things about Christianity and perhaps why it stands up to scrutiny over the other religious views of society. But what isn't presented is how to live in light of that knowledge. The Life of Grace and Truth curriculum is an intensive study of both the fundamentals of a Christian worldview and the outworking of the Christian faith into every day life. What does it truly mean to live a life based on biblical principles? 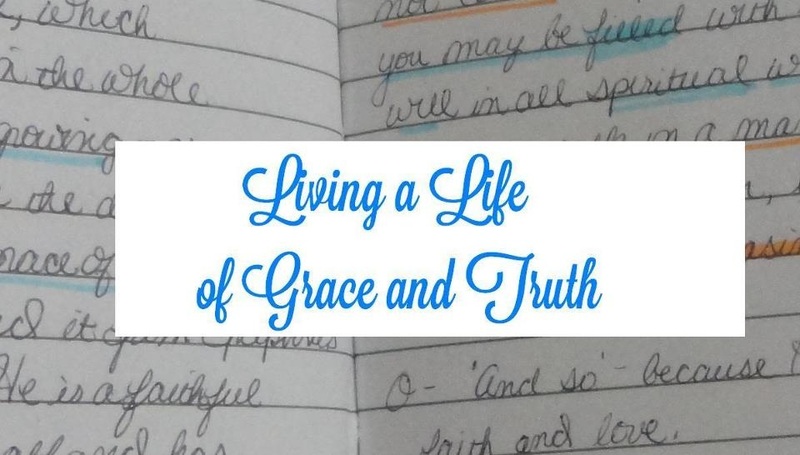 To follow the example of Jesus and be filled with grace and truth? This study is perfect for homeschoolers, high school students, families, church groups, and individuals who are tired of living a fragmented life. May God bless you as you seek to serve Him!